I grew up watching reruns of the timeless classic show, The Little Rascals series and loved it! Therefore, I was very excited to watch this film recently on our Family Movie Night with my three young children. The Little Rascals Save The Day is an all-new movie that has just been released as a Blu-Ray, DVD + Digital HD title and puts a modern spin on a classic. 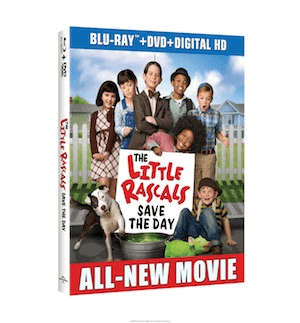 Featuring a HD picture and theater quality sound, The Little Rascals Save The Day is a fun-filled adventure featuring all of my favorite mischievous rascals including Alfalfa, Spunky, Darla, Buckwheat and of course the adorable pup, Petey the Dog! In this latest movie, the Rascals are desperate enough to do anything in order to raise movie to save their beloved grandma’s bakery. Will they finally get it right after a series of attempts to raise money go wrong i.e. a pet washing disaster, taxi service blunders and more? Will the local talent show prize money be just what the group needs to save the day for their beloved bakery? My children thought that this was an “awesome action and adventure” movie and they laughed at loud frequently at the Rascals antics and hilarious humor. It is good, wholesome fun which can be enjoyed by adults who are sure to enjoy reminiscing about their own Little Rascals memories. It is rated PG for “some mild rude humor” but I found nothing overly inappropriate for my eight, seven and six year old kids to watch. It is just silly fun and a lot of excitement that my family really enjoyed watching….a big hit for our Family Movie Night! Even my 80 year old father-in-law was giggling along with us as he talked about watching The Little Rascals show from years ago. For those who enjoy special features, we personally loved the hysterical “Gag Reel” extras along with Animatics and Deleted Scenes. The Little Rascals Save The Day is a Universal Studios Home Entertainment release which is now available for purchase for the SRP $29.99 for the Blu-Ray + DVD + Digital HD combo. It can be instantly streamed and downloaded to your television, computer, tablet and Smartphone which is handy since children are likely to ask to watch it again and again. It is available at retailers and online at Amazon.com for only $18.99! Isn’t it funny how these characters return in movies for different generations to enjoy! I’d love to see this movie. The first one was really funny! I am not keen on remakes of any kind, but this one turned out great.